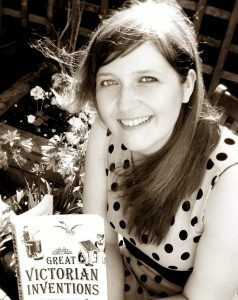 Family Tree Research Company Heir Line Ltd is run by an experienced, professional genealogist. Along with a team of professional family history researchers, we conduct family tree research for clients across the world. We have a proven track record and thus a reputation for being at the very top of the genealogy industry. 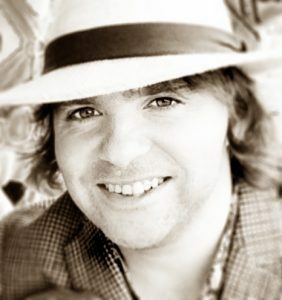 Be it local, national or international research, no family history project is too large or small for Michael Rochford, Heir Line’s young and talented professional genealogist. He works closely with Caroline Rochford, who is also an experienced family history researcher and author. With six published history books between them, and regular articles in genealogy magazines as well as the national press, there's certainly no better company to undertake your family history project. Whatever our clients' requirements ... from family history or probate research to a fantastic family tree gift ... we can certainly help! Clients with very specific genealogy or history research requirements can confidently commission Heir Line on an hourly basis, at £24 per hour. Additionally, we offer fantastic, thorough family tree packages. Our research packages make ideal gifts for loved ones, and furthermore are perfect for clients who are starting their family history from scratch. 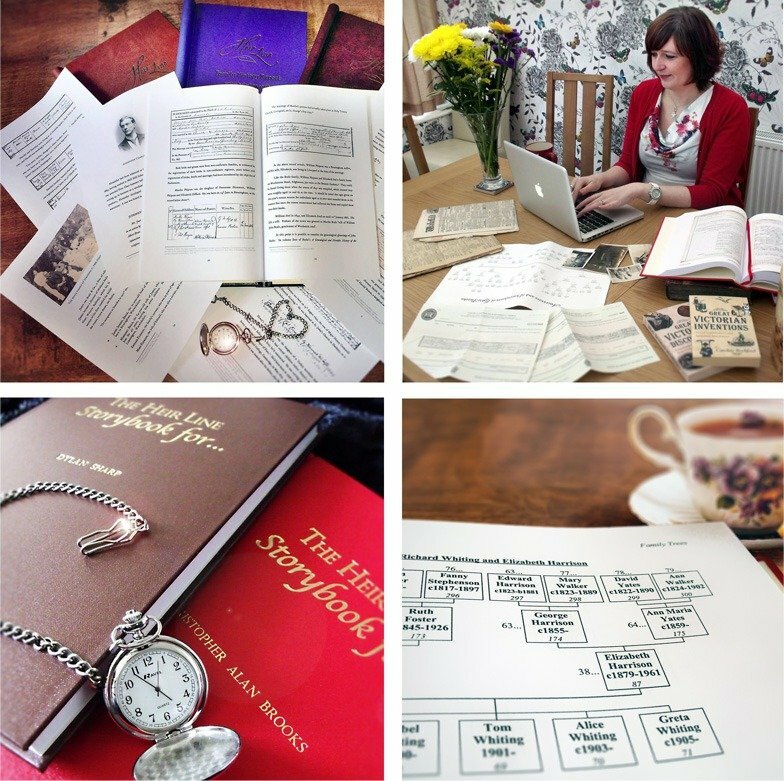 To discover your family history in fascinating detail, why not order one of our four superb research packages, undertaken by a professional genealogist? There’s one to suit every requirement. 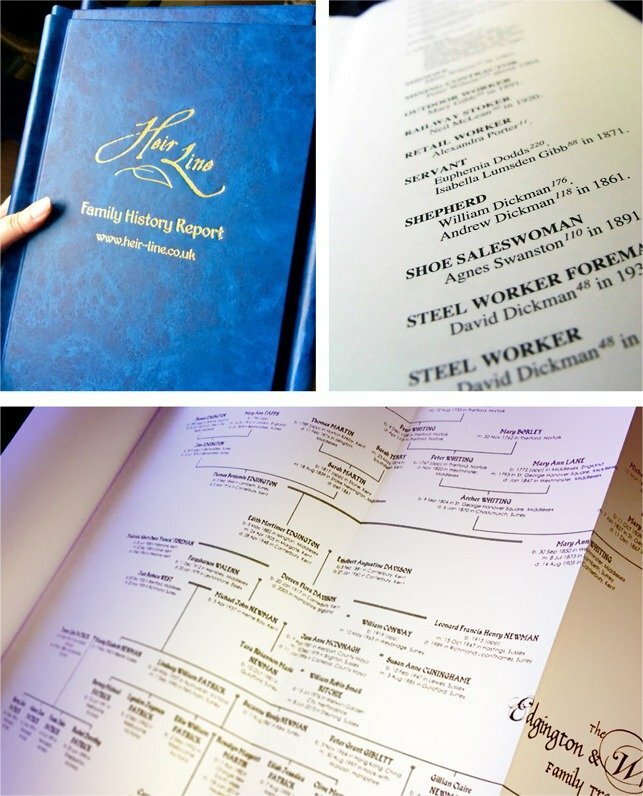 At the end of the project clients receive a fantastic family history report, full of detail and easy-to-read family trees, which bring their ancestors' stories to life. We will trace your direct ancestry back through ONE grandparent. Our professional genealogist will trace your family tree as far back as eight surname lines. We will trace your direct ancestry back through TWO grandparents. Our professional genealogist will trace your family tree as far back as sixteen surname lines. We will trace your direct ancestry back through THREE grandparents. Our professional genealogist will trace your family tree as far back as twenty-four surname lines. This is our most popular and comprehensive genealogy product. We will trace your entire genealogy back through all FOUR grandparents. With this package our professional genealogist will trace your family tree as far back as thirty-two surname lines. Our aim for each package is to trace direct ancestors back to the generation of your great-great-great grandparents. The professional genealogist working on your family history will let you know if there is scope to continue tracing your family tree further back in time, once the research is complete. Any further work to trace additional lines in your family tree is optional, and is therefore charged by the hour. Our professional genealogist will provide detailed and comprehensive information about your direct ancestors. This includes when and where they were born and baptised, married and buried; and what they did for a living. We use a vast amount of primary sources (rather than just census records, or other people's family trees). Consequently, we discover as much about your family history as possible. We display our findings in a beautiful Family History folder, which is included in the package price. The folder can be upgraded to a hand-bound Storybook, complete with pull-out A3 family trees, for an additional £195. Personalised copies of the genealogy reports are available to purchase for other family members. 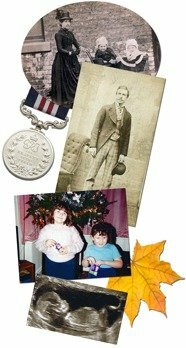 These make ideal and unique family history gifts that last a lifetime. Occasionally birth, marriage or death certificates are required in order for the professional genealogist to pursue certain lines in your family tree. These are charged separately, and will be provided along with your family history report at the end of the project. There will also be the option to purchase additional historical documents, such as wills, ordnance survey maps or property deeds. Clients who need assistance with very specific areas of their family history research can opt for our hourly service, undertaken by a professional genealogist. Perhaps there is an old family legend you would like to investigate. Maybe you live in an old property and would like to know the history of your house. 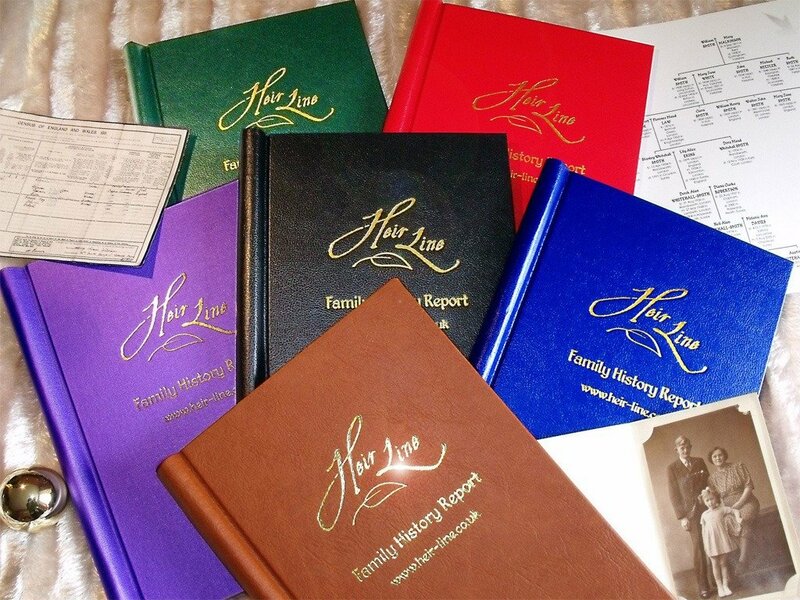 Whether you’re a hobbyist genealogist researching your own family tree, or a professional family historian working for your own clients, Heir Line can help with any aspect of your work. Our professional genealogists have access to millions of genealogical records from across the globe and have the skills to interpret them. We also have an exceptional track record for successfully knocking down those irritating “brick walls” that so many people encounter as part of their family history research. Clients can commission our family history research services in blocks of three, five or ten hours at a time, at £24 per hour. This enables them to control their budget. At the end of each block we provide a thorough, narrative report outlining our findings, complete with family tree diagrams. Because we keep all research on file clients can commission further work if desired, extending chosen lines. Sometimes these can be traced back many generations. Some clients commission further blocks of hours to send us to places of interest. Our office is close to the West Yorkshire Archive Service, as well as the Borthwick Institute at York University, and other Yorkshire record offices. Because we are close to the motorway network we can travel all over the Yorkshire region, and beyond, to find and photograph headstones. We have even found the houses, streets and buildings where clients' ancestors lived and worked. We charge £24 per hour for our old document transcription service. Please feel free to contact us to discuss your history requirements. 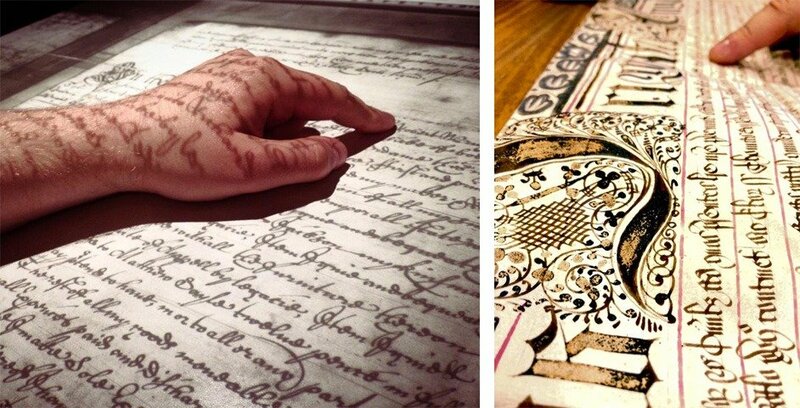 Here are some examples of the documents we transcribe. Don't know what they say? Don't worry - we do! Why Choose Heir Line Ltd to Research your Family History? Heir Line Ltd is a small, friendly and experienced family-run genealogy business striving to be the very best in the family history research industry. Michael and Caroline Rochford, Heir Line’s team of professional genealogists, work for private individuals, probate solicitors and history research companies across the globe. They trace family trees for clients from all over the world, unearthing all sorts of ancestral stories, many of which have been published in the media. Their work has also caught the eye of publishers and literary agents. Both Caroline and Michael have been commissioned by big-name publishers – Pen and Sword, and Amberley – to write history books. Michael also regularly writes for genealogy magazines such as Discover Your Ancestors. Unlike some other genealogists, Michael and Caroline are a young, enthusiastic and talented team with exceptional research skills. This allows them to find and interpret a wide range of genealogical records quickly and easily. Heir Line has solved countless family history mysteries, even when others had given up, and have received glowing testimonials from around the world. Mr. P. Heckles, Maryland, USA. Genealogy, or family history research, is one of the UK’s fastest growing industries. This is partly thanks to popular TV shows such as the BBC’s Who Do You Think You Are? and, of course, period dramas like Downton Abbey. Genealogy is a fascinating subject, but exceptionally time consuming and often difficult and frustrating. That’s what we are here for! As professional family historians, we have the experience and skills to successfully interpret historical records and trace hundreds of the ancestors in your family tree. With access to millions of genealogical records, we can delve much further into history, offering clients a remarkable glimpse into their past. 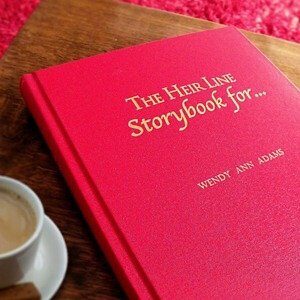 By ordering your family history through Heir Line, you may learn some surprising things about your heritage. You might even meet the skeletons that were once locked tightly away in the closet! Finished Researching Your Own Family Tree? We offer a thorough “checking” service for our clients. Genealogy can be a tricky subject, and in our experience roughly eight out of ten clients who ask us to check their work have made a mistake somewhere along the line. Even the slightest error can send the tree in a completely different – and incorrect – direction. If you have a tree on Ancestry.co.uk, (or a similar website, or even jotted down on paper), then our professional genealogist can spend a few hours checking your family history research. If necessary, we can correct any mistakes and help to knock down any brick walls you may have stumbled across. Once your genealogy research is finished, we have a variety of presentation options for you to consider. These include large family trees, ready to frame. Please type carefully, and double-check your spelling, so we can respond to you. Please tell us a little bit about the project you would like us to undertake and we will get back to you as soon as possible. I am descended from the Boocock's of Yorkshire. I contracted Heir Line to help me expand upon the knowledge I already had. The journey has been most interesting and I cannot believe how much I've discovered. Michael has been able to find out interesting details and context which have made my ancestors seem very real. He describes their professions, the places they lived, and produces documentation of his efforts. It has made me curious for more and i can't wait to walk the streets where my great greats once walked. Caroline has restored some of the photographs that have been stored in drawers for decades. Amazing to see them come alive again. Outstanding company and highly professional team. Wouldn't want to do this project without them. I'd recommend them without hesitation. Professional, ethical and a credit to their profession. Michael & Caroline are amazingly professional and knowledgeable genealogists who have worked with me for the last 5 years in tracing my main family tree back to the 1590's. Their love of history reflects in their careful and sound approach to digging up properly referenced information for all their clients. They regularly up date on the progress of their work and provide well presented outlines of their findings for anyone looking into their family history. Now on my third project with Michael, who goes above and beyond in searching out that hard to find ancestor. They even went to the trouble of taking photos of churches my ancestors had married in etc on their holiday. He always manages to find that obscure detail, however long it takes. No question you ask him is too much trouble and he is always prompt with a reply. My mum and siblings were thrilled when Michael found our Royal connections, especially the one to Princess Diane. I would highly recommend getting the bound book package, with added maps, it's well worth the extra cost. With much appreciation for the fantastic job you both have done and are still doing on this latest project. Suzanne. Melbourne, Australia. I live in the United States and almost five years ago I asked Michael to help me discover and understand my paternal family's roots in Yorkshire. It's been a wonderful voyage of discovery, exceeding all expectations, and I highly recommend Michael to anyone searching for their roots in England. He has incredible knowledge of Yorkshire/Lancashire history and geography, and explains his findings promptly in wonderfully colorful language. His instincts allow him to see beneath the record itself to understand the hidden meaning or surprising explanation for things that happened 200, 300 or more years ago, insights that I could never have appreciated on my own. Many times I thought we'd hit a dead end, but Michael somehow finds a new source, or makes a brilliant new connection, to take us around the roadblock. My immigrant ancestor left Yorkshire in 1832, and his family and times prior to leaving his home, once lost to me and all his US descendants, have come to life in ways I would not have dreamed possible. 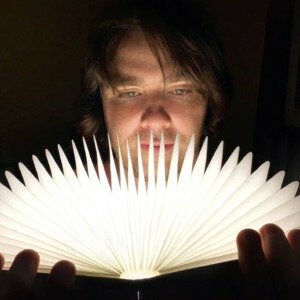 Michael's a treasure - contact him, you won't regret it. Registered company number 06527525. Registered in England.